I’m part of a panel at a women’s event and those of us on stage are asked, “Do you ever struggle with confidence? It looks like all of you have it all together.” I’ve been asked this before, told this before, and it still surprises and startles me. Because I can see my insides. I know my messes and my crazy, mistakes and stumbles, how I’ve wrestled with depression and anxiety like wild alligators, how my heart has the scars to prove it. The woman who gets the microphone first is lovely and confident, outgoing and articulate. By the time it’s my turn my heart is pounding, I’m sweating and I feel like I have something in my nose (which always happens when I’m speaking in public). I tell the audience all this and they laugh with me, thankfully. For years I tried to prove I was enough. Perfect enough. Good enough. Experienced enough. Smart enough. Pretty enough. But it’s only when we come to the place where we can finally say, ‘I’m not enough but Jesus is’ that our hearts get free. The reality is we will always fall short of the expectations of others and ourselves. But it doesn’t matter because our scandalous God, our gracious Savior, declares we are beloved and chosen and empowered anyway. Self-esteem says we can do it. Holy confidence says, in spite of us, God will. In the moments when I’m insecure and afraid, when my heart is pounding, my hands are sweating and it feels like there’s something in my nose, that’s the Truth that I really need to know. Maybe, just maybe, I’m not the only one. P.S. If you liked this post, you might love Do You Know You’re Already Amazing? 30 Truths to Set Your Heart Free. Want a preview of the devotional? Here’s a free chapter. 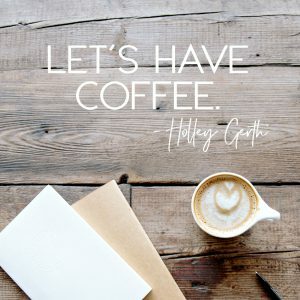 You’re invited to join the “Let’s Have Coffee” link up! Simply write a post that has the kind of encouragement you’d share with a friend over coffee and then add it here (the link up goes live at 5:30am CT every Wednesday). Don’t have a blog? You can still write an encouraging comment. If you’re reading this by email, go to holleygerth.com to see all the fun and join in too. When you link up your post, take a moment to leave an encouraging comment on the one that’s linked up just before yours. Thanks, friends! Love this, Holley. I call it Godfidence. Fistbump, hug or tear-stained…it’s real and available. Love ya! I’ve never been a big fan of the ‘self-esteem’ movement. Self-confidence is much better—but Holy -confidence is the best! That’s such an apt way of saying that our confidence needs to be placed in Someone who is infallible. I’m thankful for the times when that happens and I manage to function without being all wrapped up in myself. As a child of the 80’s, self-esteem was the big thing in elementary school and beyond. It’s taken years to shift my thinking from the bolstering of self to the confidence that comes from trusting in Christ in me. This is an important message, Holley! Thanks for shining light on our hearts! You are SO not the only one. And also, did you read my journal this morning? 😉 From all of us who glean so much from your words, thank you for wrestling through to the truth. I so appreciate your perspective and all the truth you’ve contributed to my life! Also, right now I’m reading “Nothing to Prove,” by Jennie Allen. Have you read it? Based on this post, it is so much in your heart. So true! “Be strong in the Lord and in the power of HIS might!” As always, this was so helpful, Holley. Thank you! Thanks Holley! I needed to hear that! I read your notes all the time! Love them and love you! Thank you Holley! I have been reading your posts for years….sometimes with joy in my heart, sometimes with tears on my face but you spoke God’s truth to my heart every time. Thank you very much once again! Holy confidence. .I love it. Just what my heart needed today. Thank you Holly for sharing you life with us. 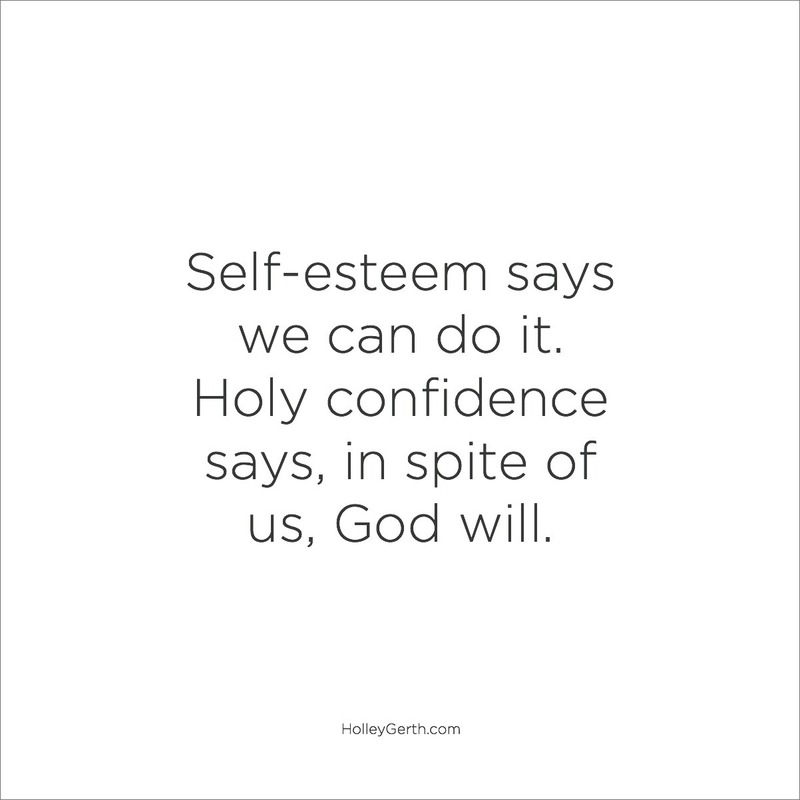 The world tells us that we need to have self~esteem but what we really need is holy confidence- Oh my goodness! Lightbulb moment! THANKS, HOLLEY, AND GOD BLESS YOU! 2018 has one darn thing after another…… just pray for me God part the waters. Thank you, Holley, for another valuable insight: “Holy confidence says, in spite of us, God will.” SO TRUE! MANY times God has transformed my paltry efforts into something he could use. Praise God he is that kind of compassionate, understanding, rescuing Heavenly Father! Thanks for being so open & honest about your fears. Many people, especially women, have a fear of public speaking. It is refreshing to have someone get up to speak & tell it like it is-warts & all. Good to know you are not the only one with pounding heart & sweaty palms. This world would tell us to have plenty of self-esteem. God wants us to have Holy Confidence. Confidence that He will enable us to do the job He has tasked us. I used to be shy & timid. You would not catch me in front of people alone. Now I have gained some Godfidence. He has enabled me to be brave & go in front of my church & small groups to do sign language to music. Thanks again Holley!! When my children were in elementary school (many years ago LOL), they were in a play where that was the foundational verse. Funny what God will use to make a point! I have loved it ever since. But I enjoyed your explanation (possibly because I can relate to chocolate in the pantry). Thanks for sharing and hosting. Blessings!